So couuldn`t wait to get back to do my card for the Less is More Challenge ...which is the colour of your Flag ours here in Gibraltar is Red and White....not to keen on Red for Cardmaking....but came up with this Penny Black Poppy Stamp......Thanks again to the Crafty Duo ...for this Fantastic Challenge Blog ...we all love it !!!!! SU. Border punch...paper ...message ...and message Punch..Spritz colour Puffer.. Despite not being keen on red, you have made a fab card with it Sylvie... the flag of Gibraltar has a tiny bit of yellow in doesn't it... the key? Maybe I'm mistaken. Whatever, your card is as great as ever. 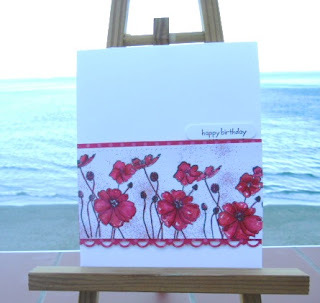 Stunning card Sylvie...love those poppies. Sylvie, you have done a great job with the red and white! Love the poppy stamp too. Just love poppies-not seen this stamp before. You've made a lovely card with it. Stunning card - just like your background !! The Harley gathering sounds like fun - must be quite a sight. I love red and think your card is really pretty. I love Harley's too, wish I'd been there. sounds like you had a fun day... your card is lovely, sylvie! Fab poppies,great red and white card, love it. Both your cards are very pretty but I think this poppy one is my favourite, so vibrant! Beautiful card, love the images. Really pretty card, those poppies are gorgeous. Stunning card- love the poppies. Hi Sylvie! Another beautiful card you have for us this week! Love the pretty poppies! 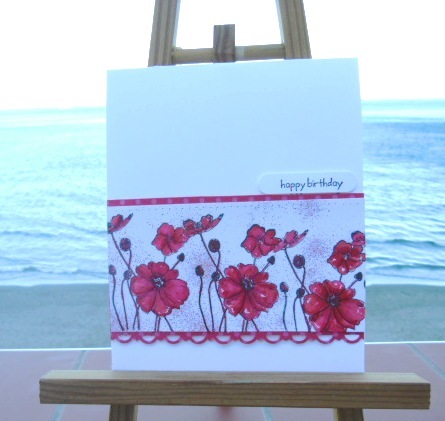 Love that poppy stamp and perfect for the colour red! Sounds like the bikes in the square were a great spectacle to see! What a very pretty card!! Your flowers are sooo lovely...I love poppy stamps(the flowers don't grow so well for me, though:)!!)...LOVELY! !